One of the best fitness equipment I have ever invested into was my Roman chair (also known as back hyperextension bench). I used to suffer from lower back pain since I sit too much and because I neglected to strengthen the lower parts of my back. The pain was so bad that sometimes I had to postpone my workouts, and it affected my lifestyle. Then, I decided to go after what the solution is and after reading researches and asked experts I decided to buy one. After using it for a month (3 times a week, 3-4 sets of Roman chair hyperextension exercises with 10-20 reps), the pain in my lower back left off. On top of that because of the stronger lower back muscles I became better performing weight lifting exercises such as deadlifts and squats. 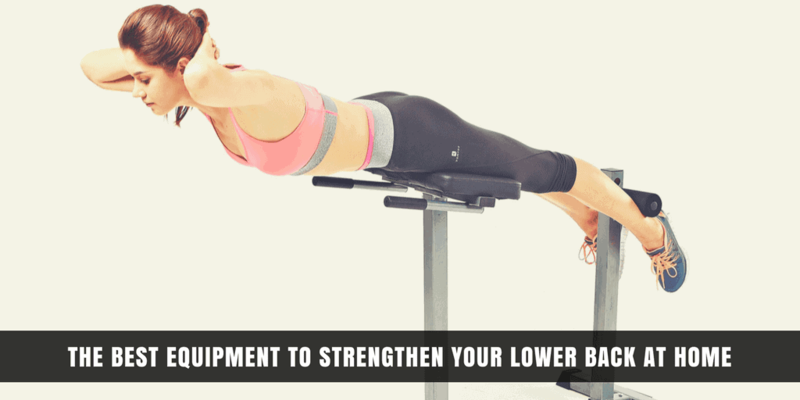 It is a fact that having strong lower back is critical considering that it takes part in many movements, and it is crucial for proper posture. Therefore investing in equipment for lower back training at home is surely good decision. 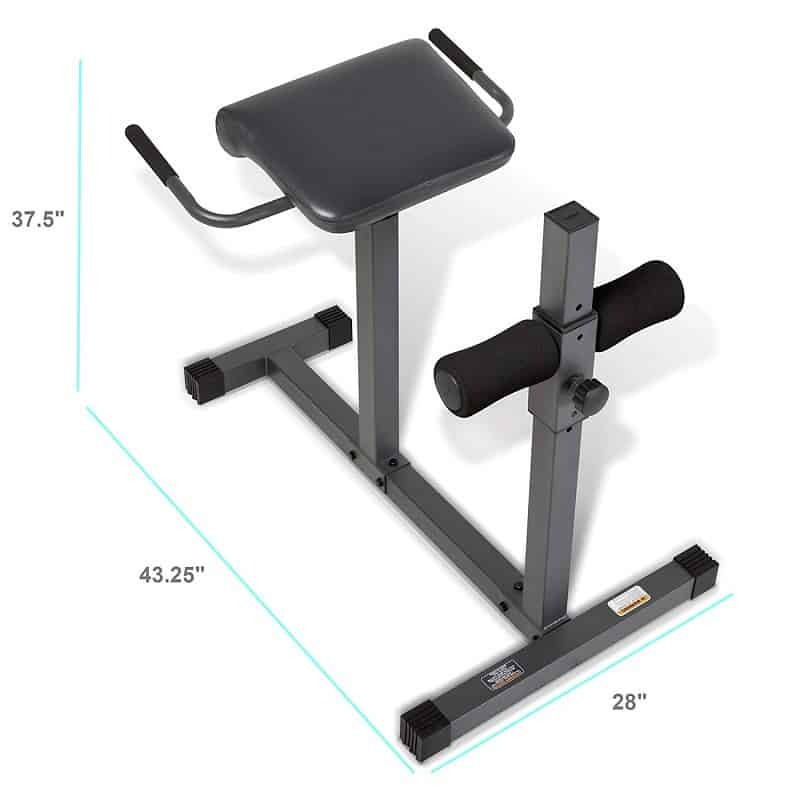 36" in length by 24" with a height of 8-10"
What are the hyperextenion bench benefits? Do you need one? Is it for you? I put this equipment to the top of my list because Fitness Reality Multi-Workout Bench is a multifunctional equipment. It can be used as a sit up, hyperextension and workout gym equipment. Also, it has push-up and dip bars. This way, for one price you will get a piece of equipment that can be used in so many ways. However, the price is affordable. The weight capacity is high, about 650 lb. This way if you have a power rack you can use it for doing chest press in flat or decline position. That capacity is enough even for a pro user to perform heavy presses or other weight lifting exercises. The board can be set to a flat position and 3 decline positions. So, you can find the level that suits the best to your sit-ups. Can be adjusted well: 4 positions for the board and 14 adjustments for the thigh support. The medium density 2.5 inches thick board density foam inside provides convenient usage. Versatile allowing you to perform more types of exercises. A few sellers complain about missing parts and bad package. If you are searching for a multipurpose and robust equipment, get this. It is going to be a really useful exercise equipment of your home gym. 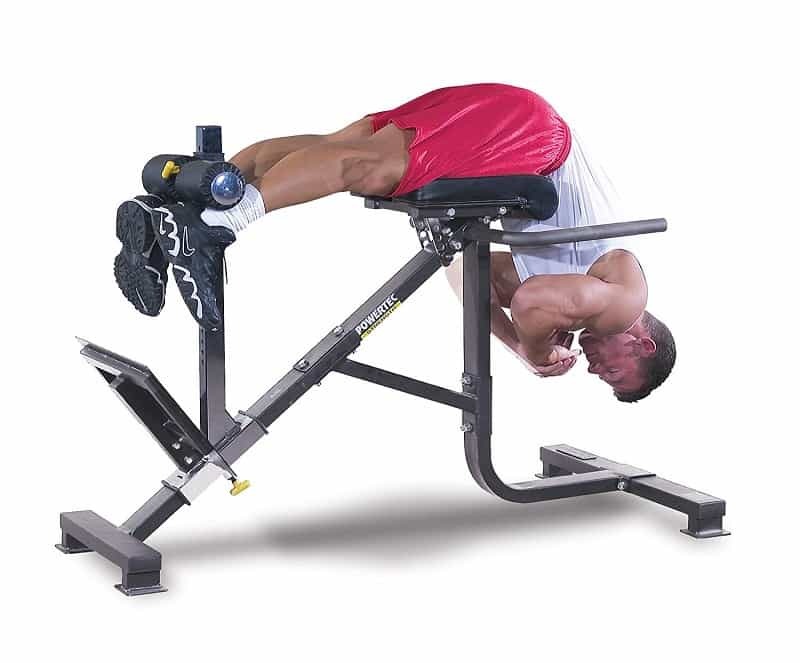 I think, it is the best sit up/hyperextension bench combination now. Sturdy and stable machine. The customers like this Body Solid roman chair machine because it is very comfortable to use and a highly-adjustable back hyperextension machine. Even suitable for larger users as it doesn't wobble at all. Seat high can be changed easily making it suitable for shorter and taller users. The cushion for the hips is soft and comfy. All the adjustments work well. Some people complain about that assembling was not easy. Higher price but good value. Robust structure and comfortable usage. If you are taller than average or a pro trainer, it is a good choice for you. 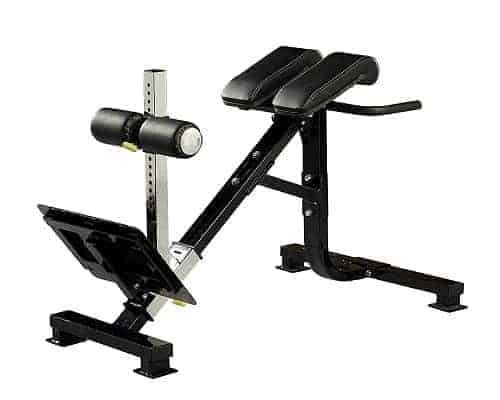 A classic back extension machine with adjustable foot rest that lets you position yourself correctly while performing the exercise. Big and sturdy so PCH24X is perfect for even taller users. It has 10-year frame warranty so we are talking about a robust model. Sturdy structure for safe usage. Wide and long enough for everybody. Adjustable footrest so that you can get the level of hyperextension you want. Some users complain about that the handle bar should be a bit longer. Roman chair exercise equipment with classic design, perfect for even professional users. This hyperextension chair comes with adjustable foot roller system, seat and footplate. It is a dual system for total core training. P-HC10 is a high quality and very functional product to strengthen your core. And if you ask me it has the best design fitting into any hone gym. It can be adjusted in many ways. 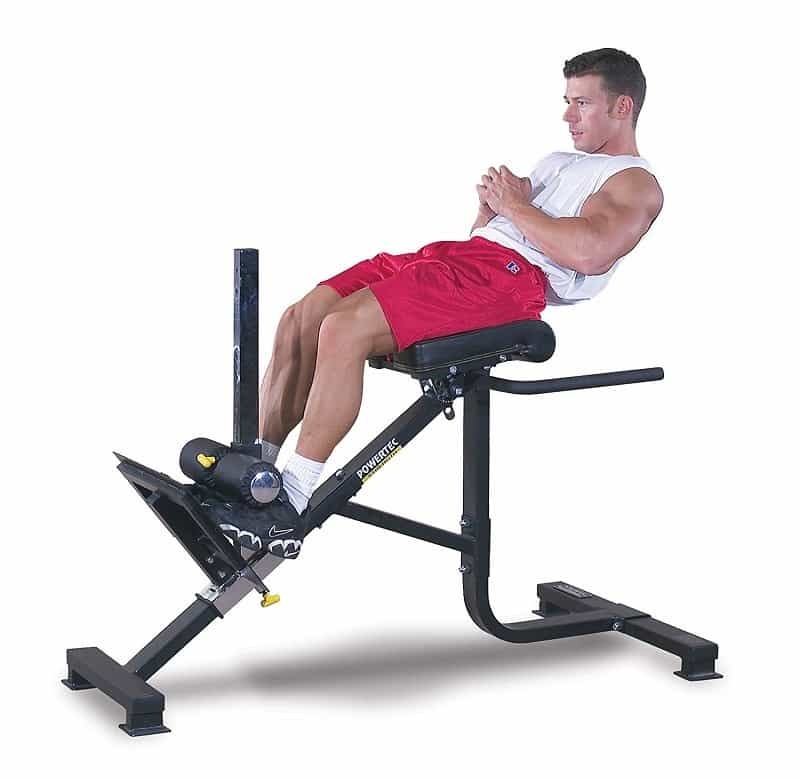 It can be used as a back hyperextension machine and as an ab bench. Not so big so P-HC10 is easy to store. You can adjust it from 45 to 90 degree. Perfect for all sorts of body types and sizes. A few people complain about delivery issues. Although, it is promoted as a high capacity and durable item, because of the bad manufacturer support, I don't suggest it. This is a cheap hyperextension gym equipment with some minor problems. But this model is absolutely perfect for an average user to strengthen the lower back at home. However, it definitely not for pro users. 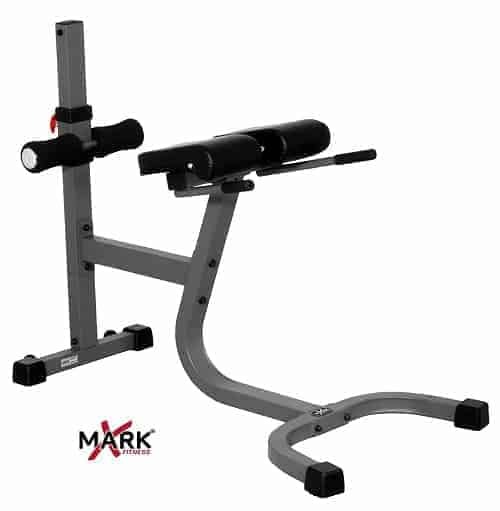 Here is the detailed review on Marcy Exercise Hyper Bench JD-3.1. The ankle pads are adjustable and covered with foam. Some users find it hard to get on, and a few think the padding not soft enough. Electrostatically applied powder coat finish. Cheaper product but OK for home usage for people with average height and weight. However, it is not for power users, for example, if you want to use extra weight. Maybe the best buy as it can be used as a sit up exercise equipment and as a hyperextension station. With the help of it you will be able to train all parts of your core, glutes and hamstring muscles. But, the maximum weight capacity is not so high. I think, it is a good choice for women to train their core at home. Read our detailed review here. Thickly padded for comfortable usage. Comfortable foam rollers which hold your feet safely while you do back extension or Roman chair sit ups. 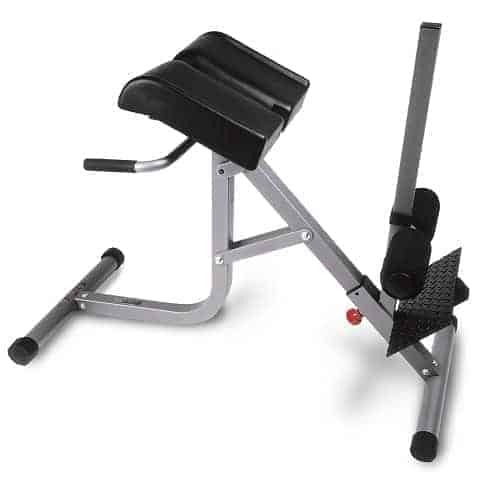 Adjustable footrest, backrest, and thigh support to accommodate height and workout intensity. Rubber frame caps for stability and to protect the floor. Some taller users complain about it is too short for them. 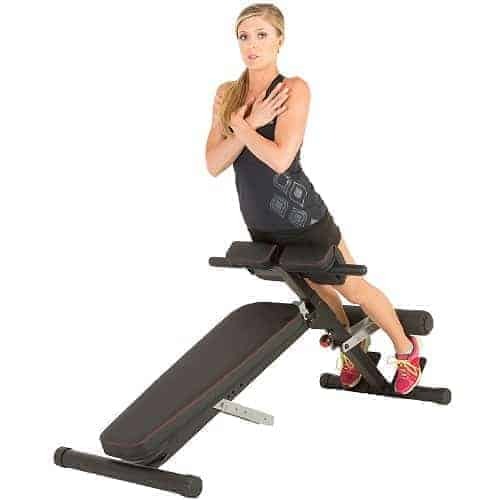 As it's a hyperextension and sit up combo equipment, Stamina is a good buy particularity for women. 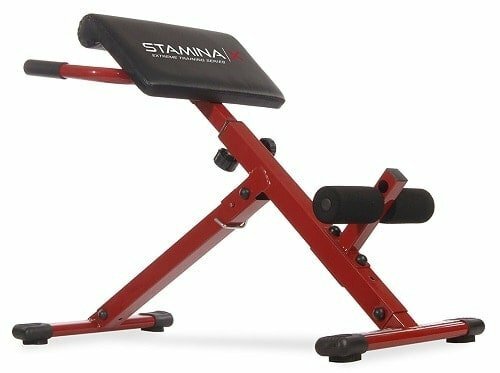 This is rather new standing Roman chair back extension machine from Stamina which is versatile and fold-able for easy storage. If you have lack of space to use and store a fitness equipment, it is a good choice for you since it has a small footprint. The board is thickly padeed for comfortable usage. The ankle pad is adjustable and non-slip for safe usage. 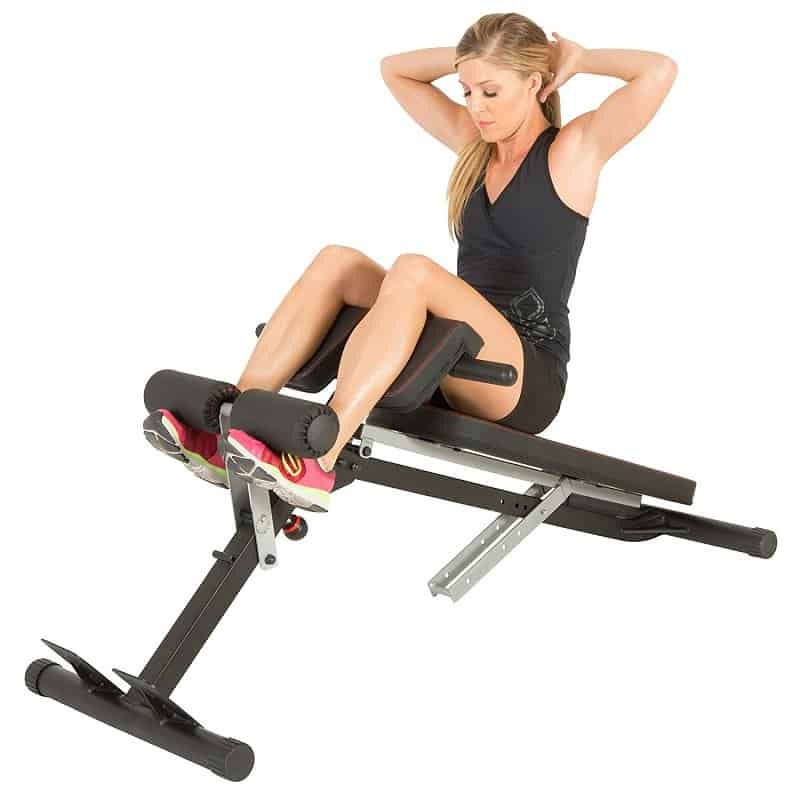 Adjustable backrest for more efficient ab workouts. Few shorter customers complain about not being comfortable for them to use. For the price it provides pretty good value. Good for people having small space at home. It has a very robust and sturdy structure, and can be adjusted in several positions. the user expeince is the same as gym quality machines have. Wide, horseshoe shaped base for stability. 10 roller pad height adjustments. Customers find it heavy, but I think that is a good point. The special design it has makes it extremely stable and the 10 level adjustment is really useful. Suitable fro professional usage. Ultra thick and wide pads. The most adjustable equipment among the mentioned ones and comes with lifetime guarantee. But it is rather expensive. There is a wide variety of models (both 90 Degree and 45 Degree) out there with less or more functions and course at different prices. Be careful since a poor quality model can be dangerous to use. Here are some tips for buying a chair. If it wobbles, forget it! You are not going to be able to focus on your workout, plus it is dangerous. It must be made from sturdy high-quality materials. If the product is heavy, that is a good sign. It must be comfortable. The midsection and the feet pads should be covered with durable, thick foam or other materials. It must be adjustable. It is important to perform the moves correctly and that is only possible if you can adjust the machine for your height. Check the size of the model you want to buy to know if you have enough space or not. Check the length of the warranty. Keep in mind that in most of the cases a cheap product will cost more in the long term. The hyperextension exercise equipment compared and reviewed above are the most popular and top rated models on Amazon, so you must be sure that you will buy a high-quality product. It lets you to strengthen and tone your entire core (obliques, lower-back, rectus abdominis). It helps to strengthen and tone your hips and waist. The hyperextension exercise is the most recommended way to strengthen the muscles around the spine. That leads to better posture and body balance. Besides the core muscles, it works the glutes and hamstring, and other leg muscles, even your shoulders. 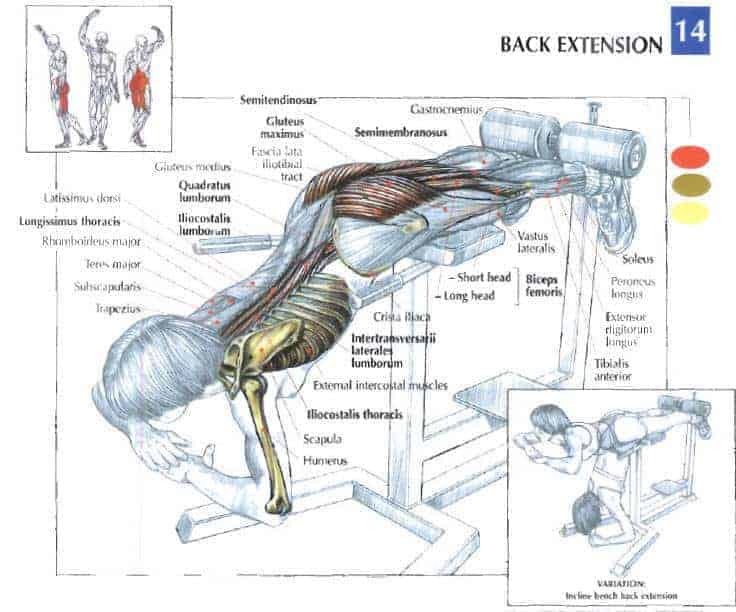 Some models come with a dip exercise section, so you can work your triceps and chest as well. Hence, they are useful for at home upper body workout programs. 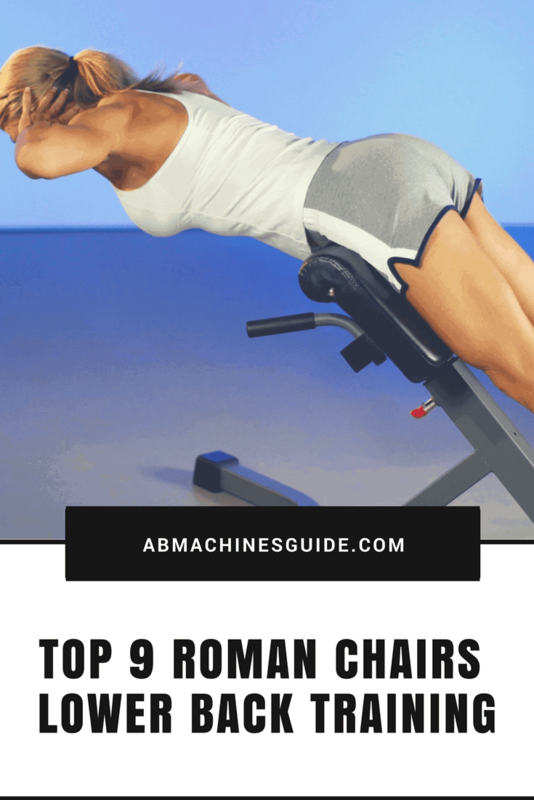 The best Roman chair equipment allow to do a wide variety of abdominal exercises such as sit-ups, or even leg raises for lower abs. You can even increase or decrease the resistance since they are adjustable. Not a big piece of equipment, there are even foldable versions. Hence, it can be even used in small flats. While the roman chair hyperextension bench is mainly used for strengthening the lower back, it engages several other muscles. For example, your gluteus, hamstrings and the muscles ﻿around﻿ your spine. The following the picture is an excellent presentation to understand its benefits. Overall, it is a one of the most useful fitness equipment for having core exercises at home. You can learn more about Roman chair extensions benefits here. want to get rid of pain because of weak back muscles. Is the Roman chair for back pain safe? If you do not have lower back pain yet, it is an excellent prevention. If you already have, then it can help but always consult with your doctor before. If you have a serious back problem, it may do more harm than good. Haven’t you use this fitness equipment before? For the lower back, the hyperextension exercise is the most beneficial. Learn how to use lower back bench correctly here. What kind of other exercises I can do with it? Can you show me a sample Roman chair workout routine? Your aim should be to have a complete core training meaning you strengthen your lower back/spine, upper/lower abs, and your obliques. Depending on your fitness level do this plan 2-3 times a week. As you see there are wide variety of models out there. What is the best? Fitness Reality is the one I prefer since it is the most versatile making it a good choice for a home gym. But if you are searching for something cheaper then Marcy is the best solution. If you have any questions, feel free to ask in the comment section. Did you find the best Roman chair for you? Share with your friends! I know that a Roman chair is great for the lower back but can it be use for doing crunches or sit ups? Yes, you can, but a sit up bench is better for that purpose. Hello! These hyperextension machines are so good but now I have no money to get one, but I want to strengthen my lower back at home. Can you suggest me body weight exercises? Yes, for example superman, but the problem with these exercises is that you can’t do full range of motion. I am 6’6″, I am trying to be good on my diet I have lost about 20 pounds I am about 430 pounds right now, my goal is 250 pounds, I got a big gut and want to target that area first with a back hyperextension machine but I don’t want too spend too much on something that may be too small and built for the average person. I don’t make a lot so I don’t want too waste money but I decided I need specialized equipment to help me reach my goals. I think, since you want to shape your abs it is better to have a sit up bench. 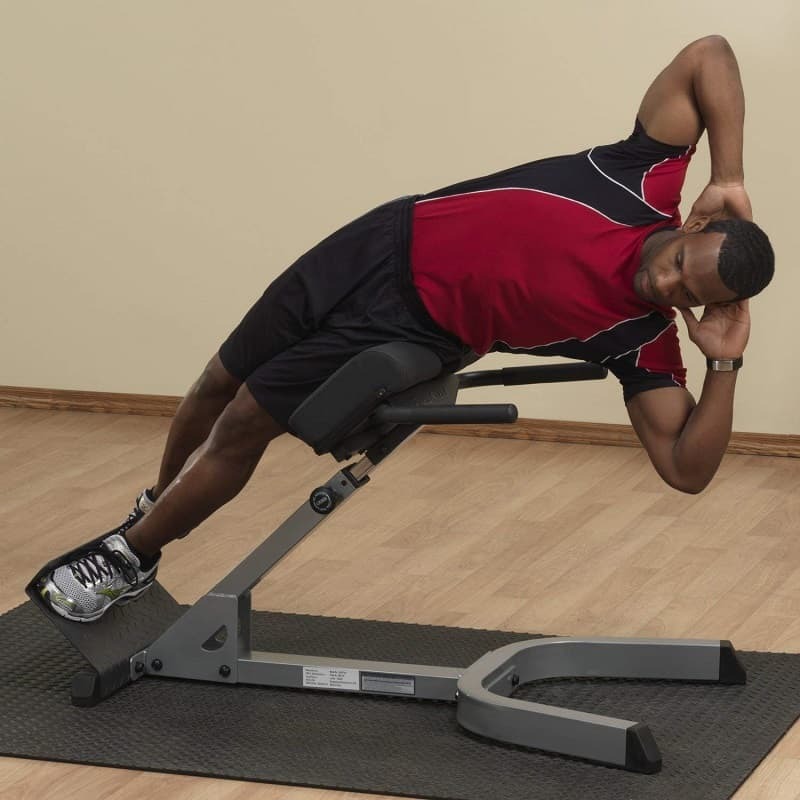 For example, the Xmark Ergonomic adjustable bench can be good for you as it is rather wide and long. You can find detailed info on sit up benches here. I’ve seen these before but never tried them. They just look scary to me like I’m going to fall out right on my head. But I’m sure they are designed so that won’t happen right? Of course, after using it for a few times you will get used to it. I have been using my roman chair for about a month now and I already feel the benefits. I have no lower back pain and I feel my posture is better as well. I recommend this equipment. Question for Walter (or anyone else familiar with this piece of equipment)…. I am looking at the Fitness Reality X-Class Roman Chair, but can’t tell from the pictures how low the board can be lowered. 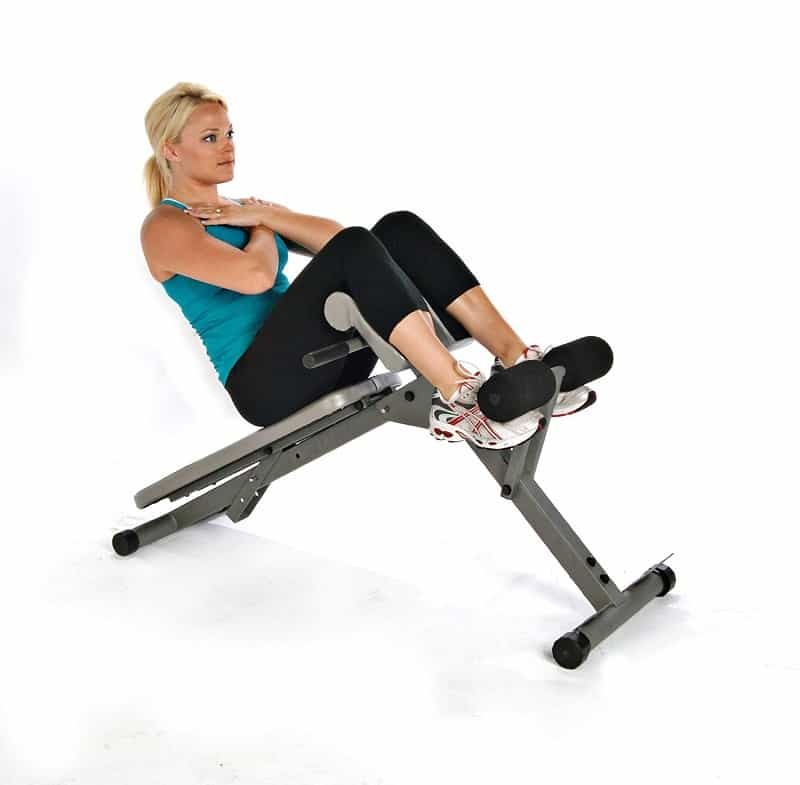 I’m concerned that if I do side crunches and “back sit-ups” on the Roman chair back hyperextension machine, that my head will hit the workout equipment. So, can it be lowered to the floor (or taken off entirely)? It cannot be taken off but by setting it to the lowest angle, you will have enough space to go down. If you want to go really deep, it is better to get a chair like Marcy, but it is more difficult to do sit ups on it. You can check out the Marcy review here. I read your leg raises post with a bar. Can I have the same benefits if I use a traditional Roman bench by using its handles? Yes, but it is a bit harder to focus on your abs since you have to hold your entire body weight. This way it works your shoulders and triceps as well.